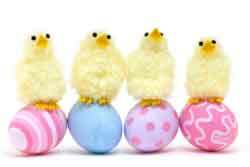 Celebrate Easter Safely and Avoid These Hidden Dangers ~ Tips from Dr. Sears of THE DOCTORS! Plastic grass in Easter baskets is a dangerous choking hazard for kids and pets. If ingested, it can cause an intestinal obstruction which is life threatening and could require surgery to repair. Safe alternative: Use edible Easter grass (which can be purchased at candy stores or online) or kale to fill your Easter baskets. Many children enjoy eating Easter eggs after scouting the house for them. But, hiding real eggs for your Easter egg hunt can cause food-borne illnesses. When you boil eggs their protective layer disappears and leaves the pores of the shell open and susceptible to bacteria, etc. Safe alternative: Use plastic eggs for your hunts, not real ones. Children love saving their decorated Easter eggs for as long as they can. However, they go bad. Easter eggs, and eggs in general, should be thrown away after one week, even if they are in the fridge. Safe alternative: If you want to keep your Easter eggs longer, blow out the inside. However, since raw eggs can contain salmonella, use a straw to blow out the eggs rather than placing your lips directly on the shell, or use pasteurized eggs. Because boiled eggs have open pores and children love eating their decorated eggs, make sure that your egg dye is safe for ingesting—not all dyes are. Safe alternative: Use food grade dye or make your own dyes. Anything that will stain your clothes can be used to dye eggs. You can use cabbage, beets, blueberries, grape juice, turmeric, dried tea or Chia seeds. To get a deep blue color, boil red cabbage leaves, add a teaspoon of vinegar and some water. Place eggs in dye and leave them there for awhile because homemade dyes take longer to set than the store-bought dyes.